Home Costs > How Much Does a Lawn Mower Blade Sharpening Cost? How Much Does a Lawn Mower Blade Sharpening Cost? Sharpening the lawn mower blade is an integral part of keeping your lawn mower in good shape. First, if the lawn mower’s blade is dull, it will pull on the grass rather than cutting through it smoothly. This, eventually, can damage the grass rather than helping it grow. Another reason that you should have your lawn mower blade sharpened is that the lawn mower itself will run more smoothly, prolonging the life of the mower. Finally, sharp mower blades will shorten the amount of time you spend working on your lawn since your mower will cut the grass flawlessly and quickly. How much does lawn mower blade sharpening cost? The costs for lawn mower blade sharpening will depend on the size of your blade, whether you perform the job yourself, and the professional performing the job. If you want to sharpen the blade yourself, you will need a grinder which you can buy for $20 to $50. For example, the highest rated lawn mower blade sharpener on Amazon retails for about $20. If you want to choose a professional, lawn mower blade sharpening can cost about $5 to $15 per blade. If you remove the blade and bring it to them, the costs can be around $5 less. According to Sharpeningshack.net, lawn mower sharpening services usually cost around $15 per blade. When sharpening your lawn mowers blade, you can either choose to sharpen it your own or you can hire a person to sharpen it. When bringing the blade into a professional, all they will ask if for you to remove the blade from the bottom of your lawn mower. This can be done by using the right sized wrench. During the process, the blade will be placed against a grinder until the blade is sharp. It should look just like the blade did when you first purchased the lawn mower. Most will also clean the blade with a wire brush and re-balance the blade when putting it back on. As with most services, a lawn mower repair service should include a workmanship guarantee. The cost of a sharpener is something to consider if you are going to do it on your own for the life of the lawn mower. If your blade is too dull and old, you may need to buy a new one. New blades can cost anywhere from $15 to $25. If the professional finds other problems that are wrong with the mower, you may need to have additional repairs done. You should sharpen your blades at least once a year. If you allow the build-up of grass clippings and debris in the blades, the blade sharpening may not work and you may have to purchase new blades. If your blades are beyond sharpening, do not let the salesman talk you into purchasing a new lawn mower. 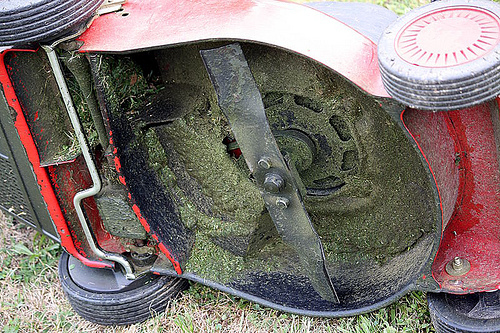 Your actual mower is probably perfectly fine and you just need to purchase a new blade or set of blades. You can probably save if you do the sharpening all by yourself. All you have to do is to further research about how to do it step by step. However, you can save more if you let it sharpened in a professional sharpener if you are a first timer with sharpening your blades. FamilyHandyMan.com has a nice step by step guide. If you can, remove the blade ahead of time. Most companies offer discounts for those that do. If you bring in the entire lawn mower and ask the company to remove, sharpen, and put back on the blade, you will be charged much more. There is probably a good chance that you have a neighbor or know someone that has a grinder. Rather than paying for your own, maybe ask if you can use someone else’s. You could even go in on one with a neighbor to save you both some money. If you clean your lawn mower blade before taking it in for a sharpening, you will probably be charged the minimum since the company can do it in just a few minutes. Compare the costs of buying a new blade. Most of the time, it could be double what a sharpening service may cost.